Caption As in the past admission to the event is free! 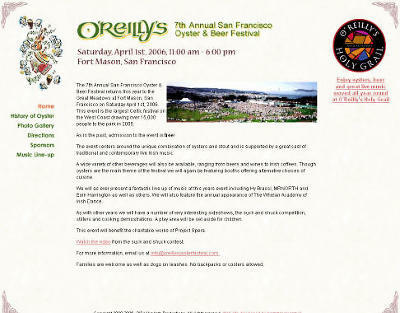 The event centers around the unique combination of oysters and stout and is supported by a great cast of traditional and contemporary live Irish music. A wide variety of other beverages will also be available ranging from beers and wines to Irish coffees. Though oysters are the main theme of the festival we will again be featuring booths offering alternative choices of cuisine.